There are some Castles in Scotland which have become famous rather in consequence of their beauty than their strength; but it will be found that those of them which are most memorable in history are noteworthy for both these elements. Edinburgh Castle, for instance, whilst long celebrated as the Maiden Fort which defied the invader, commands a prospect that alone would have made it worthy of remembrance In like manner the Castle of Stirling would have been noticeable for its picturesque situation, even had there been no important events connected with it. The beauty of its site attracted the notice of the Kings and Princes of early times as forming the position for a Royal residence, while its strength formed no mean recommendation as a protection for the Court in a lawless age. Hence Dumbarton Castle, Stirling Castle and Edinburgh Castle have at different times been the seats of Kingly power. Dumbarton was replaced by Stirling, then Perth, before the centre of government was settled at Edinburgh. No one can wonder that a Castle so beautifully situated became a favourite residence with the monarchs of Scotland. The hill upon which the Castle is built, though not in itself of any great height, towers so precipitously over the Carse of Stirling that it gains an advantage, so far as stretch of vision is concerned over more lofty mountains. The stream of the Forth, which is here a goodly river, flows around the base of the eminence, and meanders through the level country betwixt Stirling and the sea, with many a graceful curve and winding sweep. As seen from the Castle the view is exquisite. To the north-eastward stands the solitary peak of Abbey Craig, now crowned by the Wallace Monument, and overlooking the ever-memorable field of Bannockburn. Here, too, may be seen the ruins of Cambuskenneth Abbey, once a royal sepulchre; while the dark purple of the Ochil Hills forms a dim receding background. Westward the wide carse of Stirling stretches far as the eye can reach, presenting an unbroken surface of fertile and variegated country, dotted with towns and villages in rich profusion. The majestic river winds with serpent-like and sinuous writhings through the green plain, casting abroad its gigantic folds, like some stupendous chain, whose argent gleaming reflects the rays of the sun with greater intensity because mellowed by the tint of the verdant and fruitful banks through which it pursues its course. That I sae fain wad see?" In very distant times Stirling formed the boundary of the great Nemus Caledonia, or Caledonian Forest, which was an insuperable barrier against Roman invasion. And at this day the ancient Seal of the Burgh of Stirling shows a Forest, supposed to be this Scottish Wood, together with a Cross, explained as signifying the great Cross set up at the Castle, and a Bridge emblematical of the Bridge of Forth, both of which erections were due to the Northumbian invasion in 855, at which time the Castle changed hands. Tradition asserts that from the Castle the intelligent observer may descry thirteen battle-fields, among which may be mentioned Bannockburn, Sauchie Burn, Falkirk (twice), Sherifimuir, and Stirling Bridge. It is evident that a locality such as this must be rich in historic lore; and the Castle of Stirling has been the scene of many deeds of crime, of many revelries and pageants, only equalled by Edinburgh, the Capital of Scotland. Some of these incidents may be related, even though they are not placed in chronological order. The Castle of Stirling had been conferred by James I. upon his English bride, Lady Joanna de Beaufort—the heroine of "The King’s Quhair "—as her dowry, and it was here that her son, afterwards James II., was born in 1430, being the younger twin-son of the King, the elder of whom, Alexander, died in infancy. Some of the chroniclers state that the birth of the twins took place at Holyrood; but possibly this may be an error caused by the anointing and crowning there of James II. in 1437, a year after his father’s assassination at Perth. This may be doubtful; but it is certain that the King (James II. ), in Febnary 1451-52, perpetrated at Stirling one of the blackest deeds of treachery which is recorded against the whole Stewart race to which he belonged. From the time of King Robert the Bruce the family of Douglas, whose founder was the fellow-warrior of that King, had been rising into increased power. Honours were showered upon them by successive Monarchs—at first in gratitude but latterly in fear. For the dominion of the Douglases spread so widely, and drew within its scope so many warlike nobles that the Lanarkshire Earl might soon out-number the Crown in wealth, as in forces. As it was impossible, therefore, for the King to quarrel with so powerful a subject, he endeavoured to win the Earl over by making him Lieutenant-General of the Kingdom. But the possession of so important a post seems rather to have inflamed the ambition of the Earl than bound him to the King. So overbearing, indeed, had he become that the Monarch, whose favourite Douglas had been, was compelled to withdraw the Royal patronage, and to deprive the Earl of his post. The disappointed nobleman retired in chagrin to his Castle of Douglas and meditated schemes of revenge against the King and the Court party. Nor was he long without opportunity of gratifying his vindictive spirit. One after another of the King’s followers were attacked upon some pretext, sufficient in those times to justify sudden reprisal; and the Monarch soon found that he had made a dangerous enemy in the Earl of Douglas. But it was not until he had openly disregarded the King’s mandate that he was finally abandoned. The Earl had summoned his vassals to meet him upon a special occasion. Amongst those whom he had thus summoned was M’Lellan, known as the Tutor of Bomby, in Kirkcudbrightshire. This unfortunate man had provoked the Earl by refusing to join with him against the King; and Douglas had kidnapped this daring vassal, and carried him off to the Castle of Thrieve. The uncle of M’Lellan, Sir Patrick Gray, Captain of the King’s Guard—then a favourite with the King—obtained a Royal mandate ordering Douglas to release M’Lellan. "Nay," said Sir Patrick, "sen thou hast ta’en the head, make what thou wilt of the body; for thou shalt answer shortly to the King for both." And mounting in hot haste, Gray sped to Edinburgh to report this outrage, pursued by the myrmidons of Douglas. The recital of this new attack upon his kingly prerogative decided the King to adopt severe measures against the Earl of Douglas; but he took a crafty method of doing so. Having discovered that Douglas, who ruled in the south, had agreed with the Earl of Ross, who was all-powerful in the north, and the Earl of Crawford, whose influence spread throughout the east coast, to maintain each others quarrels, even against the King himself, his Majesty, fearful of the conspiracy, summoned his Parliament to Stirling to advise upon it. After deliberation, it was decided to bring Douglas to this conference, and to endeavour by argument to break this alliance. A safe conduct, under the hand and Seal of the King, was sent to him requesting his attendance. Trusting to the honour of his liege-lord, Douglas approached with but a few adherents, and even those were excluded from the precincts of the royal palace. Alone, therefore, the Black Earl entered that portal through which he never more should pass. The King met him with accustomed cordiality, and, after supper, retired with him and a few of his counsellors to an inner apartment to discuss the affairs of State. Here James thought to persuade Douglas to abandon his league with the Earls Ross and Crawford; but threat and persuasion were alike powerless upon him. Irritated beyond measure by this continued obstinacy, and well aware of the result of too great leniency towards him, the King at last drew his dagger, and exclaiming "By Heaven, if you will not break this league, I will," he stabbed the unfortunate Earl to the heart. The old enemy of Douglas, Sir Patrick Gray, with all the bitterness of his last grudge against him, was not slow to aid the King in his felon intent, and the body of the murdered nobleman was thrown from the window of that apartment in the Castle which is still called "the Douglas Room." However disreputable the means employed, it is certain that the step which the King had taken ultimately compelled him to adopt repressive measures against the Scottish nobility, and finally to overcome and destroy the long-established feudal system. And, as a curious instance of historical retribution, it may be mentioned that the murder of James III. (son of James II.) at Sauchie Burn, was popularly attributed to the son of this same Sir Patrick Gray, the King’s accomplice in his attack upon the Earl of Douglas. Many additions were made to the Castle during the turbulent reign of James III., who made it his favourite residence. He built the large hall, now called the Parliament House, and erected the Chapel Royal, celebrated in song by the poets of the period; which was afterwards demolished by James VI. to make way for a more pretentious structure. There is little doubt that the violent death of James III. was immediately caused by the treachery of the Castellane whom he had put in charge of Stirling, and who refused to open the gate to the King while in retreat. During the reign of James V., Stirling was the scene of a very ludicrous scientific fiasco. The reputation which the King had gained on the Continent as a lover of literature and art had attracted many foreign adventurers to the Scottish shore. Poets, musicians, and alchemists flocked to the Court whose Monarch laid claim to a wide sympathy with the art of each professor; and as the craze of the search after the "philosopher’s stone" was not yet exploded, King James fell an easy prey to charlatanry and imposture. Chief among the alchemists that had gained an ascendancy over the King was an Italian monk, who so dazzled his dupe by unlimited promises that nothing was withheld from him. He was made Abbot of Tungland, and assigned apartments in the Castle that he might pursue his Rosicrucian studies unmolested. That this monk was neither a Dowsterswivel nor a Subtle, may be surmised from the fact that he so far believed in his power as to experiment on himself. Having made aerial flight his study for a considerable time, he at last announced that he had solved the problem which had perplexed mankind till his day. He invited a large company to witness his triumph over gravitation; and having mounted the battlements of the Castle he boldly flung himself from the parapet. But he had miscalculated the attractive influence of our planet upon him. And so the astonished multitude, who expected to see him cleaving with mighty wings the blue empyreum, were shocked and dismayed to behold him falling like some ordinary mortal earthward, unable, even with the aid of all his familiar spirits, to escape the broken limb which the most illiterate lord might have as easily gained, without bravado. One cannot but admire the pluck which led the Abbot to make this rash experiment, and the ingenuity with which he explained his failure. "Many of the feathers," he wrote, "whereof my wings were composed had been unwittingly taken from barnyard and dunghill fowls. Hence the earth had more influence upon them since they were unused to upward flight. Had they been eagles’ feathers then the attraction of the heavens would have been as great as the attraction of the earth was in other conditions." There is no record of his ever having tried aviation afterwards. For a considerable time the Castle of Stirling was selected as the place of Coronation for the Scottish rulers, and the fact of its being a favourite residence for royalty brought it into notice as the birth-place of a succession of monarchs, and it was also the scene of several tragedies connected with the royal family. Some of the latter incidents may be briefly noticed here. Alexander I., who reigned from 1106 till 1124 is the first Scottish King who is recorded as having died at Stirling. William the Lion— 1165-1214——died at Stirling in his 71st year. David, second son of Alexander III., born in 1273, died in Stirling Castle in 1281, aged 8 years, and as his elder brother Alexander died in his father’s life-time, the succession fell to Margaret, "the Maid of Norway," whose death in 1290 brought about the trouble with the claimants, in which Edward I. of England interfered. While James I. was a prisoner in England, his uncle Robert, Duke of Albany, was Governor from 1388 till 1420, in which year he died at Stirling Castle. His son, Murdoch, became Governor, but when James I. returned to his kingdom in 1424, he accused Murdoch of treason, and caused him to be beheaded at Stirling Castle in the following year, together with his son, his nephew, and his father-in-law. James IV., in 1488, when he was only 16 years of age, was brought from Stirling Castle by the Lords, who had rebelled against his father, James III., and was present at the Battle of Sauchie Burn, near Stirling, where the King was assassinated. Alexander, Duke of Ross, sixth child of James IV., was born in Stirling Castle, and died there in 1515 in his second year. Prince James and Prince Arthur, sons of James V., both died in infancy at Stirling Castle, in 1541, thus leaving the succession to the Throne open to Mary, Queen of Scots, who was born in 1542, the year of her father’s death. She was crowned in the Chapel at Stirling Castle in September 1543. The year 1571 witnessed a series of tragic incidents. John Hamilton, Archbishop of St Andrews, was accused as concerned in the murders of Henry Darnley and also the Regent Moray, and was hanged at Stirling Castle. The Regent Lennox, father of Darnley, was shot in a skirmish at Stirling; his successor, the Regent Mar, died at Stirling Castle in 1572. James VI. was baptized in the Chapel of Stirling Castle in 1566; and his beloved eldest son, Prince Henry, was born in the Castle in 1593, but died in 1612 in his 19th year, and thus the King was succeeded by his second son and fourth child, afterwards Charles I. These are all facts relating to the connection of the Royal Family with Stirling Castle. The Union of the Crown in 1603, when the King and Court removed to London, had an important effect upon the whole of Scotland, and especially on Stirling Castle. The place fell out of notice for a considerable time, and until the great Marquess of Montrose restored the renown of Scottish chivalry its existence was placid and uneventful. The brilliant exploits of this famous commander brought renown to Scotland; and during the century which followed, the position of Stirling Castle as the key to the north by the east coast made it a scene of continued turmoil and strife. Stirling Castle was captured and held for a short time by the Covenanters. In 1651, after the defeat of General Leslie and the Covenanters at Dunbar by Cromwell, the fugitive Scots made Stirling Castle their rallying-place. This led General Monck to besiege and reduce the Castle, and to carry off many of the national documents that had been brought from Edinburgh as less secure than Stirling. It was from the Castle in the same year that Charles II. set out upon his invasion of England, which was terminated by the fatal Battle of Worcester. At the time of the Union of the Parliaments in 1707 Stirling was one of the four Castles that were specially described as the most important in Scotland. The first trial of its strength occurred in 1715, when Argyll on his way to Sheriffmuir was well-supported from the Castle. The next attempt on the Castle was in 1745-46, when the army under Prince Charles Edward was retreating northward. The leaders of the Highland forces promised the Stirling people would not be molested; but this pledge was not respected by the Jacobites, and general plunder was the result. Preparations were made to besiege the Castle; but the conflict at Falkirk, where the Prince was victorious, led to the prolongation of the siege (against the will of Prince Charlie) until the advance of the Duke of Cumberland’s army compelled a retreat northward, which ended at Culloden. Since that time Stirling Castle has remained unassailed. James VI. was the last Scottish Sovereign to live in residence at Stirling Castle. The Duke of of York (afterwards James VIII. and II.) was here with his family for a short time in 1685, amongst them being the daughter who became Queen Anne. In September 1842, Queen Victoria and Prince Albert visited the place; and in 1859, the Prince of Wales (afterwards Edward VII.) examined the historic Castle, so closely connected with the lives of his remote ancestors. STIRLING CASTLE : ITS PLACE IN SCOTTISH HISTORY. By Eric Stair-Kerr, M.A. Edin. and Oxon., F.S.A. Scot. Pp. viii, 219. With numerous Illustrations. Crown 8vo. Glasgow : James MacLehose & Sons. 1913. IN this volume Mr. Stair-Kerr sets forth in a clear and attractive manner the events which went to make Stirling Castle one of the great historic places of Scotland. The story of Stirling Castle is in a great measure the history of Scotland, and the author has been careful to avoid expanding his volume into a national treatise, and has adhered closely to the narrative of events that concern directly the ancient stronghold on the rock. In the opening chapter the author takes passing but adequate notice of the various associations, more or less mythical, which are attached to Stirling by the early chroniclers. The castle definitely comes into authentic history in the reign of Alexander I. (1107-1124), who dedicated a chapel within its walls. Alexander died in Stirling Castle, leaving the crown and a prosperous realm to his brother, David I., who made the fortress one of his chief residences, many of his charters being dated ' Striuelin.' During the period of national prosperity that ensued Stirling did not take an important place, but in the reign of William the Lion it emerged into prominence in sad and humiliating circumstances. William, captured at Alnwick in 1174, was confined by Henry II. of England in the Castle of Falaise, in Normandy. After several months conditions of peace were arranged, and William was set free upon signing the Treaty of Falaise, by which he swore to be the vassal of the English King, and agreed that the Castles of Roxburgh, Berwick, Edinburgh and Stirling were to be garrisoned by English soldiers. This document was in its effects one of the most far reaching that ever was penned. It gave substantial grounds for the subsequent claims of the English Edwards to the overlordship of Scotland, and was thus a prime cause of those disastrous wars between Scotland and England which for four centuries curbed the prosperity of England, and caused Scotland to be a backward, poverty-stricken land, a prey to the attacks of foreign enemies from without and to the spoliation of contending factions within. Not until the eighteenth century was nearing its close did the last embers die out of the fire which the unfortunate Treaty of Falaise helped to kindle. Mr. Stair-Kerr's chapter on the War of Independence shows the importance which was attached to Stirling as a stronghold in those stirring times: it was the prize for which Stirling Bridge and Bannockburn were fought. During the days of the Stewarts, from Robert II. 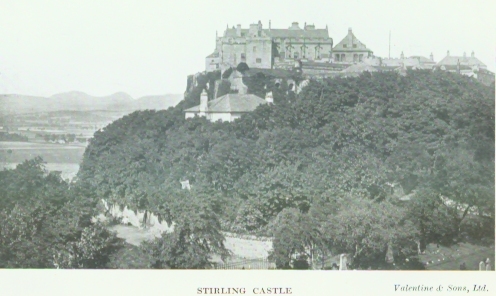 to Queen Mary, Stirling Castle was at its zenith. Here the Court remained for long periods, the Palace, the Parliament House and other buildings were erected as we know them now, the Royal Gardens were laid out in great splendour by the old Tabyll Round, below the Castle to the south, and the King's Park was the scene of many a merry hunt. Tournaments and games, pageantries and morality plays, dancing and music occupied the days and nights. Nor was the tragic note awanting, as when the blood-stained Heading Hill witnessed the execution of Duke Murdoch and his sons, or when James of the Fiery Face plunged his dagger in Earl Douglas's body and flung the corpse out of the window. Pathetic scenes there were, as when Queen Margaret, holding the infant King by the hand, met the nobles at the gateway, and rung down the portcullis ere from behind its bars she refused to surrender the castle ; or as when Archibald Douglas of Kilspindie panted up the hill beside the King as he rode to the castle, seeking, but finding not, some kindly recognition from the set face of his sovereign. Amusing incidents happened too, as when the French Abbot of Tungland attempted, with a pair of wings of his own making, to fly from the battlements, and fell among the refuse heaps of the Castlehill ; or when the Gudeman o' Ballengeich sallied out on some of his unkinglike adventures among his subjects. With the departure of James VI. for England, in 1603, Stirling ceased to be a royal residence. It was still a place of importance, however, so long as there was righting to be done. It figured largely in Cromwell's campaign, and although Oliver got no nearer than Torwood, his next in command, General Monk, besieged the castle and forced its surrender. During the Jacobite troubles of 1715 and 1745 Stirling Castle again came into prominence, and with the imprisonment and execution of Baird and Hardie, the Radical martyrs of 1820, the castle passes out of history. There is a very interesting chapter containing a comparison of the castle of Stirling with those of Dumbarton and Edinburgh. Dumbarton was prominent as a dwelling place of princes before the other castles emerged from the haze of tradition, but the War of Independence brought the three strongholds into line. All three were the scene of romantic exploits and heroic feats of arms, and each was at one time or another the refuge of sovereigns in distress. Dumbarton dropped earliest out of the stream of national history, and Stirling and Edinburgh both became places of less importance after the Union of the Crowns. Mr. Stair-Kerr devotes to the subject of Stirling Castle in poetry a chapter which we would like to have seen expanded. It is a suggestive and fruitful theme, and if prose writers had been included, more might have been made of it. The author tells of the visits of Burns, Wordsworth, Scott; and it is to be noted that it is chiefly as a haunt of visitors that Stirling figures in literary history, at least after we have named the ballads, such as Young Waiters and the references to the castle in Blind Harry, Barbour, Dunbar, and Davie Lindsay. We have nothing but praise for the manner in which Mr. Stair-Kerr has executed his task. The illustrations, consisting of drawings of the old buildings of the castle by Mr. Hugh Armstrong Cameron, are excellent, and include several taken from original points of view. DAVID B. MORRIS.